Hollybeary Creations : It's a Girl Thing!! It's almost time for the August Release from Your Next Stamp and this month we're doing things a little different. Instead of a sneak peek we are doing a Themed challenge using some Fun Re-Released sets. 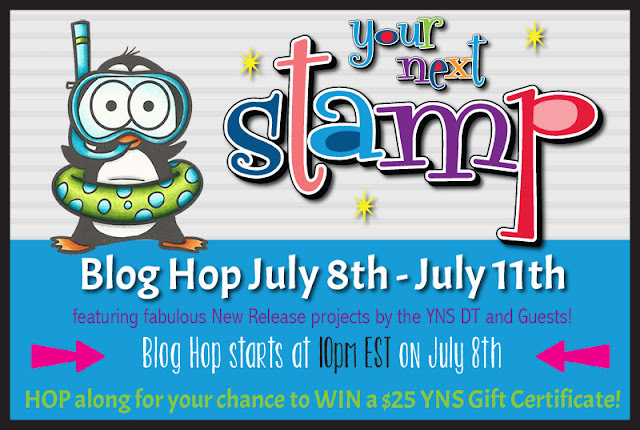 Tomorrow night we will have a Blog Hop featuring more Re-Released sets and some Fun new Products as well. We were challenged to a theme "It's a Girl Thing" and the DT created lots of cute projects just for the Girls!! 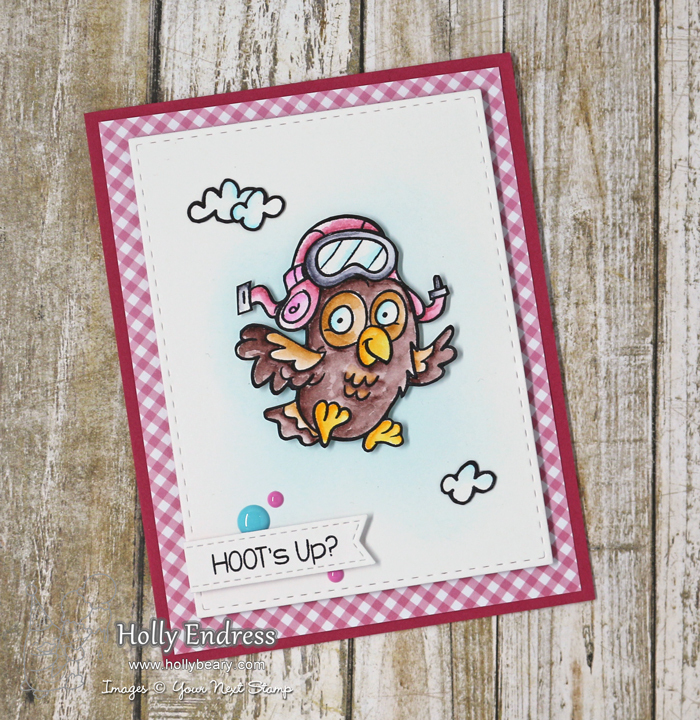 My project features the Adorable set Hoot's Up? I die cut a piece of Bristol cardstock using the Stitched Rectangle Die set and then I added some Tumbled Glass Distress ink to the center very lightly to create just a little background for my image. Then cut a piece of the Hugs and Kisses 6x6 paper and adhered it to a Rose card base. I adhered the White panel to the pattern paper panel with some foam tape. I stamped the Owl and the cloud images onto some more Bristol paper using some Archival Ink and colored them in with the Zig Clean Color Real Brush markers and a water crush. Then I fussy cut the images out and added some Black marker around the edges to clean them up a little. I adhered the owl with some foam tape and the clouds are adhered directly down with some liquid glue. I stamped the sentiment on some White cardstock and die cut it using a banner die. Then I adhered it to the lower edge and added some of the Heart and Dot gumdrops. 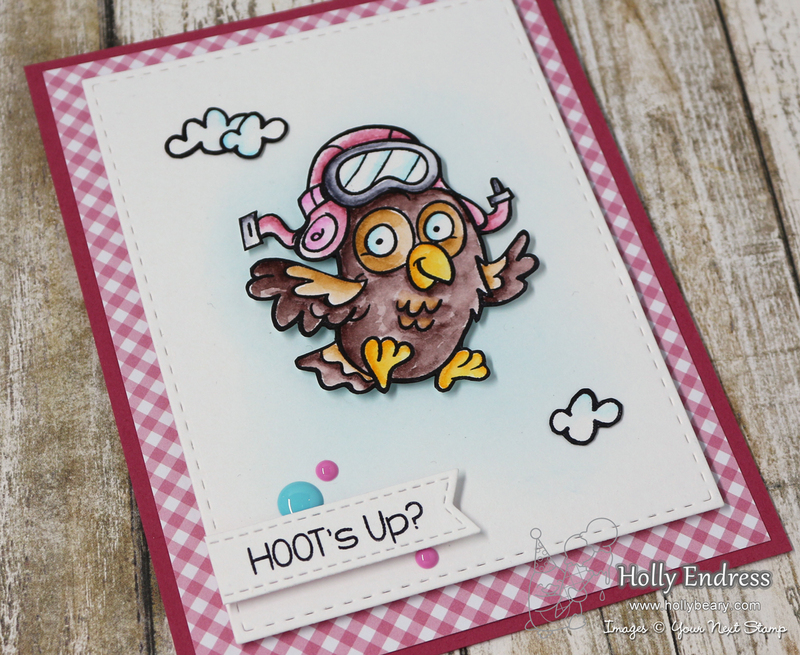 Head over to the YNS Blog for more Fun Girl Projects from the Design Team and be sure to leave a comment while you are there for a chance to Win a Stamp Set of your Choice. Be sure to join us at 10pm est tonight for the August Release Blog Hop!! Great watercoloring and cute paper Holly! Sweet card, Holly. Love the girly colour of the paper.